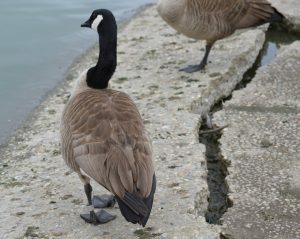 Saturday, 2/11/17, member Cindy Crawford was at El Dorado Park Duck Pond checking out the Winged Wonders Tour when she came across a banded Canada Goose. Cindy took photos and called the phone number on the band to report the sighting. 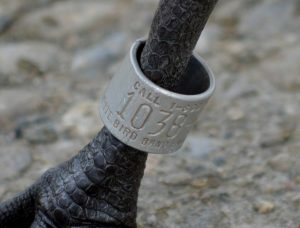 All we know at this point is the bird was banded somewhere in Los Angeles on 8/14/15. The banding lab will research further and let us know. We’ll post an update when available. Cindy received a Certificate of Appreciation in the mail; good job Cindy! On another note, check out the Winged Wonders educational self-guided tour and all the waterfowl hanging around the duck pond lately, which includes American Wigeon, Ruddy Duck, Northern Shoveler and more. There are 24 banners around the pond and each with a number. Call the number on the banner which is 562/257-3608 and then press 1# to hear the intro and then continue on by pressing any number 2 through 24 followed by the # sign.